Although bees and wasps (bees will refer to both unless otherwise noted) are necessary to help balance the ecosystem, you probably won’t want them anywhere around when you are out on a picnic. Their stings can be very painful and even life threatening to certain people with allergic reactions to the stings. Unfortunately, keeping bees away from a picnic isn’t as easy as keeping away most other insects because insect repellents don’t have a strong effect on bees. Pick a picnic site where there isn’t a bee nest nearby. Bees are more aggressive when they are near their nest. If an area has a lot of bees, there is probably at least one nest in the area. The only thing you can really do to avoid a nest of bees in a public area is to relocate your picnic site. Remove any bee's nests from your property before having a picnic there. If there are many bees buzzing around on your property, observe where they are flying to and locate their nest. You can deal with most nests by yourself. The best method to get rid of a nest is to spray it with a poison spray. Bees have a difficult time flying at temperatures below 50 degrees F so the best time to spray them is at night, especially on a cold one. Wear clothing that covers as much of your body as possible. Spray the nest for several seconds from about 10 feet away and then get back quickly. The poison should kill or immobilize the bees within seconds. Check back on the nest in a couple days to make sure all the bees are dead. If any bees are still alive, spray them again. If the bees nest looks too large to safely exterminate by yourself or if you are allergic to bees, don’t attempt to kill the bees yourself. Instead call a professional to deal with the problem. Keep all your food in a sealed container until it is actually time to eat it. Then once you are done, reseal all the uneaten food and throw away all the garbage in a trash can that has a lid on it. Bees are most attracted to the smell of sugary foods. Be sure not to leave cups or cans of pop or juice around. Instead bring bottled drinks with caps. Don’t wear anything scented when you go to a picnic. 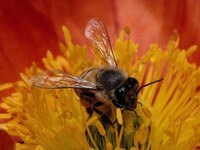 Bees may be attracted and react to certain perfumes, colognes and scented soaps. Bright colored clothing also attracts bees. Capture the few bees that happen to come across the site if they are bothersome. Even after taking all the above precautions to avoid bees, it isn’t too unlikely that a few will come across your site anyway. Use an insect net to capture the buzzing nuisance and then lay the net against something flat and solid like pavement. Kill the bee by crushing it with your shoe. Don't swat at bees in the air with your hand. Act calm when they around you, and they probably won't sting. Don't use poison to kill bees at a picnic. The poison mist in the air could end up landing on your food.